We’ve recently learned that U.S. News & World Report has given a number one ranking to our state’s economy, and a number two ranking to Colorado Springs as a “best place to live.” This must be received as terrific news, no matter how one qualifies the criteria for such rankings. It’s hard not to notice the signs of economic and cultural vitality across the state and around our fair city. There are also indications of an underside, a counterpoint to that vitality. Rising home prices and housing starts are crowding out middle-income first-time homebuyers, and increasing rents are hurting many. Costs of health care and health insurance are increasing, putting the health of growing numbers of Coloradans at risk. We are proud of our colleges and universities, but their costs to individuals and families are increasingly beyond reach, while our public schools are inadequately funded and struggle to retain teachers and our high-school graduation rate is 46th, well behind smaller and larger states. In a strong economy with a lower-than-national-average unemployment rate of just over 3 percent, we overlook the more than 600,000 residents among us who live in poverty. 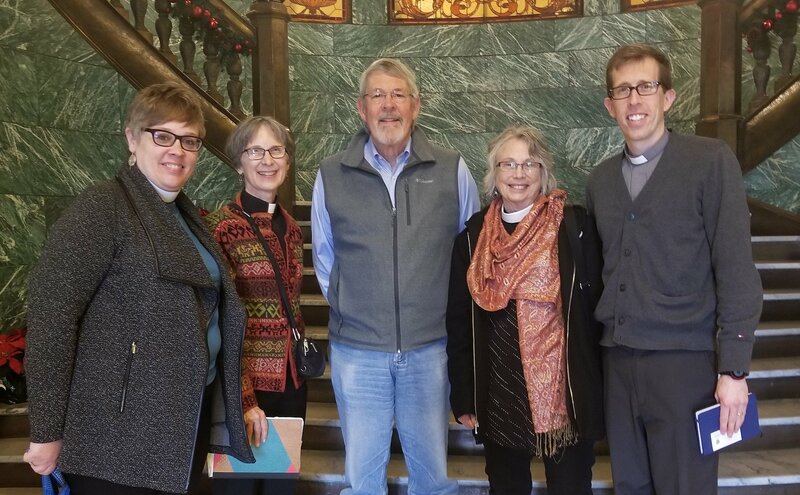 Persons in our community of Colorado Springs who identify with a religious tradition most certainly will acknowledge that all human life has meaning and value, and that there is inherent dignity and worth bestowed upon each of us by the one whom we confess to be the source, the origin of our life. As we attend to the presence of this one within us and among us, we discern our life as a gift whose source is the divine love that calls us to live in peace and cooperation with others, and to extend that divine love to all with whom we share the times and places of our living. So now is a good time to remind ourselves of our common humanity that transcends social and economic stratifications and give ear to the summons to live peaceably with others and seek their well-being. We have entered another political season, and all indications are that it will be raucous and unusually partisan. Candidates’ policy options and ideological positions will clamor for the voters’ endorsement against the background of competing socioeconomic and political values and visions. It will be easy to take up adversarial postures, view the neighbor as an opponent, and the community we share as contested space. But what would happen if, during the run-up to the election in November, we took time to reflect on where our loyalty or loyalties lie, and how our political sensibilities are influenced by the common good? What if we sought common ground and mutual understanding rather than political warfare and dismemberment. We have multiple loyalties, and some of them may collide with one another. If we understand loyalty as the ability to take up, commit to, and remain in a relationship or attachment to an “object of loyalty” in a manner that recognizes the object’s value, and promotes and nurtures the ability to seek the object’s well-being, then we can recognize the many loyalties we hold and their relation to one another. We have developed loyalty to loved ones, friends, businesses, institutions, religion, community, causes, ideas, and yes, our nation. We have many individuals, associations, and attachments in our lives, but we are not loyal to all of them, and we are not equally loyal to those we claim as the object of our loyalty. I suggest that we try directing a loyalty to our community as a whole and not merely to that which serves our interests or those who share our point of view. 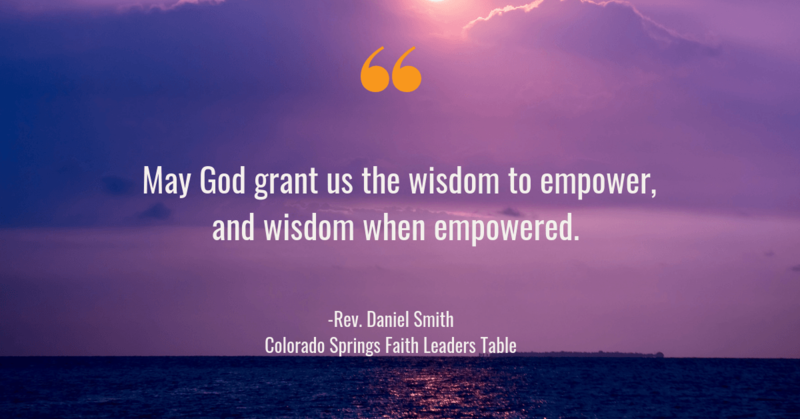 It just might be that affirming and enacting a loyalty to Colorado Springs as a human community in our conduct and relations with one another might strengthen the capacity of the community to enable all its residents to thrive. It might make it more likely that we strengthen and improve the requisite conditions that make it possible for all to flourish. This redirection and enlargement of loyalty to include the whole community – all its residents – will be difficult and challenging. But we must think again about our loyalty, and in doing so we remind ourselves that any pledge of loyalty is a costly one, for at its heart it is an enactment of what Paul wrote to the Philippians: Look not only to your own interests, but also to the interests of others (Phil 2:4). What makes loyalty so costly, whether its object is another person, a cause, or a community, is precisely its intention to secure rather than imperil the interests that make it possible for its object to thrive, to realize its potential and experience an integral sense of well-being. Loyalty to our community, in this sense, is just what is needed in this season and going forward. 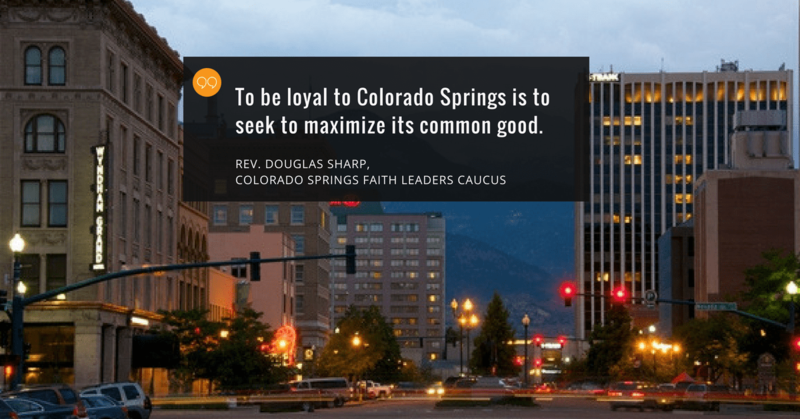 To be loyal to Colorado Springs is to seek to maximize its common good. Rev. Dr. Sharp’s Op-Ed originally published on The Gazette on May 4, 2018.